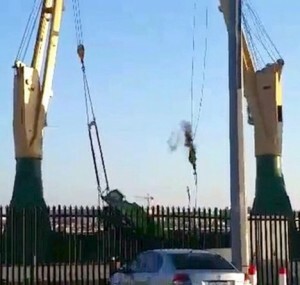 Two ship cranes dropped a large mobile telescopic crane they were lifting in tandem at Fremantle port in Australia on Tuesday. The hoist rope on one of the two cranes clearly failed dropping one end of the crane which then slipped from both sets of rigging. The mobile crane dropped into the ship’s hold, sending those working in the area scurrying for safety. One man was caught by the falling mass and suffered minor injuries. The local union claims that the ship based employees carrying out the lift were not qualified under Australian regulations. The lift was clearly being carried out in a slapdash manner with one of the hoist lines not directly over the load, therefore applying a side load. It also looks like one crane might be carrying more of the load than the other? The Australian Maritime Safety Authority (AMSA) has detained the vessel while it investigates the incident. Click here to view a video of the incident.